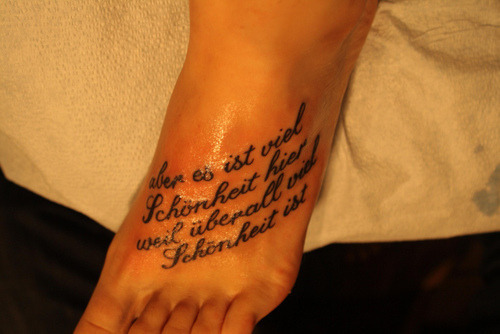 I’ve been thinking for some time about getting a tattoo in German, but the question was always what it would be. The words that I love the most in German – for example, Klugscheißer, Nickerchen, Knoblauch – are ones that I don’t think I’d want permanently written on me. They’re fun to say, but perhaps not particularly meaningful on their own. But last week I was reading Rainer Maria Rilke’s “Letters to a Young Poet” and came across a quote, the second half of a sentence, that I found to be quite lovely. It read: “aber es ist viel Schönheit hier, weil überall viel Schönheit ist”. The translation of this is: “but there is much beauty here, because there is much beauty everywhere”. For the past few months, I’ve been writing my first novel, which I kind of consider to be an autobiographical romantic Bildungsroman. Part of this process involves not only writing chapters on a regular basis, but also reading a lot of authors. These can be all kinds of authors, but namely ones that write or wrote on similar types of themes. And one such author I’ve been reading a lot of is Rilke. I’ve enjoyed what I’ve read of his in the past, but I have to admit that it’s only six months ago that I really fell in love with his writing and have been scrambling to get my hands on all of it, be it in English or German. It’s difficult for me to explain why this quote means so much to me, because there are some emotions that just can’t be articulated. Suffice to say, as cliche as it sounds, I’ve always been of the school of thought that there is beauty in everything. That said, I’m not going to elaborate, if only so I don’t end up sounding like the kid from “American Beauty.” But it’s an optimistic sort of sentiment, and a reminder to myself to keep things in perspective regardless of where I am, even as I set out on this journey of trying to find a place where I belong.